If you suffer from poor digestion, bloating, bloated stomach, constipation or diarrhea, chances are there’s one thing you’re not doing. This is by far the simplest, most effective way to improve your digestion and avoid bloated stomach right away. You might be surprised by how incredibly this remedy is to improve your gut health. So simple right?! Yet so often people rush through their meals and aren’t consciously chewing their food until it’s ready to enter the other digestive phases. Why chewing our food helps with a bloated stomach? What most people don’t know is that the digestive process starts in the mouth. When we chew our food, the digestive enzyme amylase is released through our saliva and begins the process of breaking down starches. When the amylase doesn’t get even time to interact with the food, it skips the important first step of the digestive process! This is when you run into common problems like acid reflux, bloating and general digestive discomfort. A good rule of thumb is to chew each bite of food at least 20- 30 times. Now I’m not saying sit there and chew every bite of food that goes into your mouth for the rest of time. But it’s useful to get an idea of how long this really takes. For most people, this will likely double the amount of time you spend eating. When you eat too quickly your body can’t catch up to let your brain know when you’re actually full. Slowing down helps you to only eat what your body needs and avoid the digestive discomfort that comes along with overeating. In France, Spain, and Italy it’s much more common to take your time eating. These cultures have a lower incidence of modern diseases and digestive disorders than North America, as well as a lower incidence of obesity. When you slow down and thoroughly chew every bite of food that enters your body it opens the space for more enjoyment and gratitude. These things might not seem important, but they’ll do more for your health than any green juice ever will. So slow down, and start thoroughly enjoying every bite you eat, your belly will thank you. Another plus of chewing more your food is that you help your brain receive the signal that you are full. It takes at least 20 min for your brain to receive the message from the stomach that you have had enough. If you chew your food more and take more time you allow those signals to tell your brain: “Stop eating” the moment you are actually satisfied. Otherwise, you will end up overeating. So I challenge you for your next meal to chew each bite at least 20-30 times and notice how you feel after you finished. **Do you feel more satisfied? **Did you notice that you actually ate less? 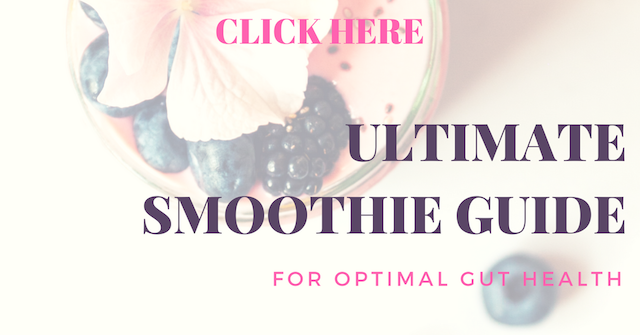 And, if you’re seriously interested in helping your digestion, avoid bloating and in the process boosting your energy then check out my new comprehensive guide “Smoothie Guide for Optimal Gut Health“. Which I’m offering FREE for limited time only. See the details by clicking the box below. In the guide, you get delicious and satisfying smoothie recipes to help with digestion and gut health, and as a bonus you will receive my “Diet Transformation Plan”FREE with the best tips and advice that I give to my 1:1 coaching clients on a day to day basis, but you will get them free. Join me also on my Facebook group where I’ll be sharing more information, tips, and recipes to help you live a happier, healthier life.